As we get closer to the end of the year the weekends only seem to move faster and this was certainly the case this weekend when Saint Rose inaugurated our 11th president. Friday was such a busy day with a formal inauguration of Carolyn J. Stefanco followed by a dance party that evening. 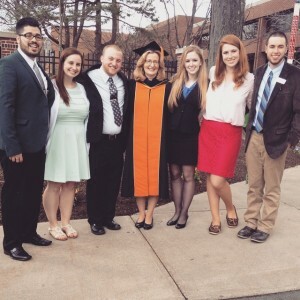 The SA Board with President Stefanco after she was inaugurated. I am not going to lie, I was most into the dance party because it meant that I got to spend time with my Student Association board members,eat some snacks, and only mildly embarrass myself on the dance floor. The night featured a pretty awesome band that played covers from nearly every decade that appealed to everyone in attendance. The dance party again showed me that Saint Rose is an amazingly inclusive community because I was dancing not only with friends but board of trustee members, professors, and of course the president. The dance party also offered me another chance to bust out some of the Saint Rose items that I have ordered over the past year as the school spirit chair for Student Association. These items included foam fingers and pompoms, of course in Saint Rose colors. At first I thought that only the children in attendance would like the pompoms but I was elated to find out that the adults were just as into them. It truly was a unique sight to see so many different people, whether they be students or deans, dancing with pompoms in hand to extraordinary covers of music to celebrate another day in Saint Rose history.